Ribbon of solid gold flowed over a gold neckwire, with a free moving amethyst pear drop set the stone setting can be worn either way ,the stone is as pretty from the back so why not ,this sold very first showing gotta be quick! Well these were so good QVJ wanted to keep these ,the most stunning Montana agate cut by an artist truly one offs the colour was so beautiful set into 9ct Yellow gold (although this photo makes them appear white)with diamond cut Garnets on the top the picture does these no justice ,again sold at first showing. Welo opal and Diamond in 18ct yellow and white gold ,this flew so fast we only had this picture wow. Fashion dress ring with chamfered edges and face mounted in 9ct gold and set with diamonds. 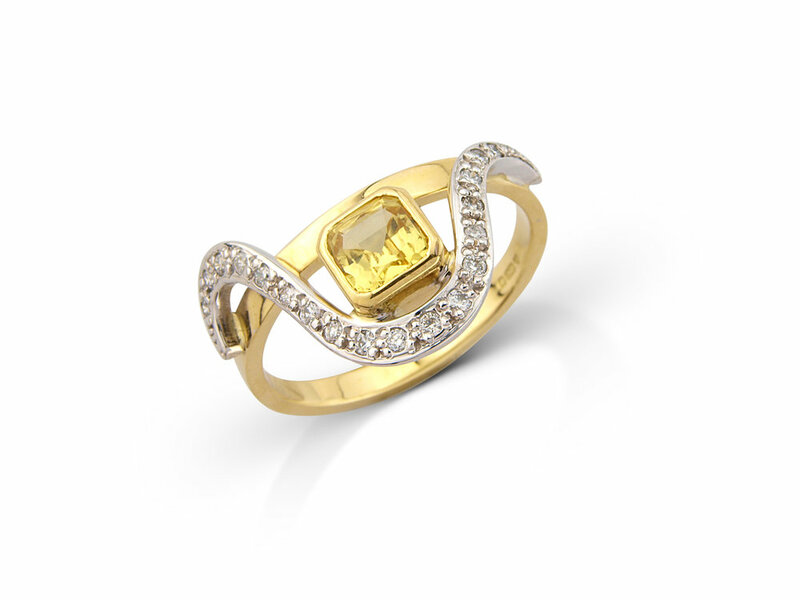 Yellow sapphire dress ring mounted in 18ct yellow gold and set with diamonds in white gold. Australian boulder opal dress ring mounted in 18ct gold and set with Colombian emerald and diamonds.